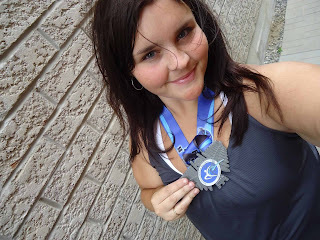 Yesterday I received the weekly newsletter for the Lose a Marathon Challenge. 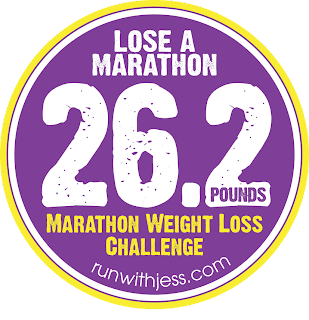 In it, Jess discussed the struggle that a lot of people are dealing with - not losing weight. There's only four weeks left of the challenge and it sounds like a lot of participants (including myself) are a far way from losing the 26.2 lbs. Instead of aiming for an unrealistic goal, she suggested that we aim for half a marathon instead - 13.1 lbs. I've lost just over 8lbs since this challenge started back in June. That's not a lot of weight lost in a little over 2 months. However, my summer has been so busy with parties, bbq's, trips etc and the fact that I've lost weight and not gained is a victory for me. I also believe that switching my weigh in days from friday to monday has helped tremendously. Weekends were always a write-off in the past and now I have weekends where I actually lose weight. I'm pretty sure that I'm going to continue with Monday WI's after the challenge is over. I've decided to readjust my goal for the Lose a Marathon Challenge and aim for half a marathon, 13.1 lbs. Which means I have 4 weeks to lose 5lbs... totally doable! That would also bring be to the 35 lost mark. I would love to lose 8 more (2lbs/week) but we'll see how things go. The next 4 weeks are going to be the toughest ones yet! On Monday my parents arrive for a 2 week visit. They'll be staying between mine and my sisters house and when they're not at my place, I'll likely be at my sisters.. so meal planning will be difficult. Not to mention that during these 2 weeks it's my birthday and my sister's baby shower.. so the food will be flowing! I always gain weight when I'm with my parents. We tend to cook larger meals, more snacks and more dining out. However, the last time my mom came to visit I managed to maintain my weight. We still ate out, cooked bigger dinners and had events to go to, but I tracked my food and exercised as much as I could. I'm excited for the coming weeks, but I don't want them to be a set back. My goal is to run 3x per week and save the calorie splurges for the days that really matter (my birthday and sister's baby shower). Good Luck on those 5 pounds, and good goal! Hi! Sorry to hear about your struggle but I think it's a really good idea to be realistic about weight loss. Are you following any diet in particular or do you just watch on what you eat? Do you have an exercise plan or do you just workout whenever you can? I wish you the best for you new goal keep us updated!! Sounds like a manageable plan! Good luck!